A new, but characterless tramping hut 1000m above Lake Hawea. 8 mattresses on 2 sleeping platforms. Tank water. No fire. The hut sits on the new 'shortcut' track which cuts off Timaru Creek halfway from Timaru Hut to Lake Hawea, and heads more directly towards Hawea township to hit the lakeshore 1km from its southern end. From the ridgeline above the hut, there are great views over Lake Hawea and the town of Wanaka to the snowcapped divide beyond. Beautiful. (Un? )fortunately the hut sits in a sheltered tussock hollow on the other side of the ridge, and misses both the view and the prevailing westerlies. There is a steep 4km tramping track up from Lake Hawea, climbing 1000m first is an series of zig-zags on cut track, then up a rough ridgeline scramble. To the east, 2 option are available: a tussock tramp over Breast Hill, or an old farm 4wd track. 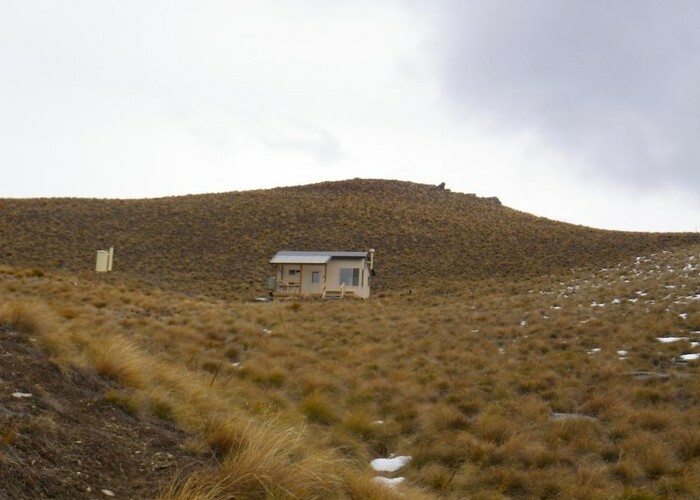 Both lead to the ridgeline above Timaru Creek, and give access to Stodys Hut. Pakituhi Hut • By madpom. Licence: cc by. Added 18 September 2011 by madpommadpom. No revisions. 262 views in the past year (22 per month).